It's What's for Breakfast | Daddy's in Charge? I by no means am a gourmet chef. I find cooking for kids to be one of the worst things about parenting. You want to make sure that they are eating a healthy well cooked meal, but half the time the food that you spend thirty minutes slaving over a hot stove with, goes uneaten. I can see why kids only eat things like chicken nuggets and fish sticks. Who wants to put effort into a meal the kids could care less about. Breakfast is one meal that I have mastered. There is no prep time or massive cleanup and the boys usually eat what's in front of them. If only they could eat cereal, eggs, and bagels for every meal, our cook (me) would be much happier. Here is one meal that I have come to love over the years, it's quick, simple, and easy to do. That is of course if you have the right tools. Without them you should probably just stick to cereal, I mean everyone has a bowl right? The trick is to find a waffle that your kids will eat. Through trial and error, I have found that my kids will eat pretty much any waffle put in front of them, so that makes shopping a little easier, you can just buy what's on sale. 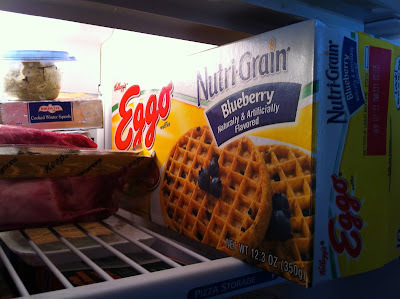 For todays purpose we will use the Nutri-Grain Eggo waffle. They really enjoy the blueberry variety and we all know that blueberries are full of antioxidants, so that's a bonus. Place your frozen waffle in the toaster. My wife insists on microwaving them. Why she would go through all that effort is beyond me. We have a fancy toaster that takes a lot of the guess work out of toasting the waffle. See the two buttons pushed; FROZEN and WAFFLE. Pretty simple stuff. The next step is the most important; you need to push down the lever or the waffle will remain frozen. Studies have found that the waffle tastes better when it is cooked. Crazy I know. When the waffle is done, this is where I go against the grain. I use a pizza cutter to cut through the waffle, but feel free to use any sharp object that you may have on hand. You could of course just feed them the waffle whole, but our kids are not animals and should not be treated as such. Now that the breakfast is served, you might want to try pairing it with a cup of low fat milk and sit back and be amazed that your kids actually do know how to eat. After breakfast you just might want to consider having waffles for every meal. Why on earth would I make something extravagant again? That's what we go to restaurants for. For more awesome culinary delights check out Solitary Mama and link up your favorite. You have a superty duperty fancy toaster. Mine doesn't say Frozen and Waffle so I'm not quite sure this recipe is going to help me. Next time, please keep in mind that most of the population has a regular toaster that doesn't even have words. Quit it with the I'm a superior chef gig. mkay? MAN! That Christina Majaski sounds MEAN AND BITTER? I mean, really?!! We buy toasters to let THEM do the work... If I had to play a game of guesswork with these things they would never come out right. That to me sounds like a visit to IHOP which I love! I believe you're referring to a TV dinner which incidentally is the best recipe ever invented. I am usually not mean and bitter-I just take my toasters very seriously. Sorry, Big Head. Nutri-grain has to be a great choice because it has grains and nutritiousness. I'll add this to my very short list of things I can cook. That was chef-tastic! Truly inspiring, and holla for sneaking the Nutri-grain in. I have toaster envy. That's the only thing I can say without sounding mean and bitter. Why do I feel like I'm being mocked? No DKL... it's not you. If all you did was food that would be one thing. I posted one last spring and I just got inspired by Christina's Anti Blogging series. You did notice though that I linked to you? No more food from me, until my cookbook comes out. It's a nice toaster... it beeps too when it's done. It's simple James, you could probably do it. That should be a page-turner! Absolutely because they will be flipping through it looking for actual recipes. Mock mock mock mock ahahahah. Did you already do a toaster waffle recipe, DKL? Don't feel bad. I'm gonna do one too. With a toaster with no words. The advanced version. That is impressive. BUT, and this makes ALL the difference in the world - do you serve REAL maple syrup? What the hell, Brucie and yes I'm totally bogarting JW's blog, but why would anyone use real maple syrup on a toaster waffle. Real syrup is for microwave pancakes at the least. I'm keeping her company while I comment away...done with all the stream in Triberr...that doesn't happen to often or last very long, as you well know, CM! It doesn't look like I am in charge anymore around here. My kids like EVERYTHING plain... On the rarest of ocassions they will use syrup but it's usually out of one shaped like a woman. Um so I think cooking for kids is THE worst part of this gig. DESPISE it actually. We have waffles twice a week minimum. I put peanut butter on top for some more protein. Cook on. Well, lets see 90 % of my stuff is food, so maybe I'm being mocked ? Mmm, may do more recipes since I get more page views on them than the nutrition/health posts. Lets see, I got 4000 + pg views via pinterest on one of my old foodie posts today.. still getting them so hey who cares as long as you get page views huh :) I'm all about the views. That is a fancy toaster BTW & just maybe will let you guest post a recipe on my blog. No actually it isn't only about page views. Sometimes other things matter besides the number of page views a person gets. I wonder why people always think every blog post is about them. And in the grand scheme of things, your 4000 + page views from pinterest means what? Oh the pinterest...that people liked that post .. well actually it was a detox post ( not a recipe) & I was joking about it being all about the page views. U know am not like that. Guess I blog what I want to blog like everyone else :) which includes recipes among other stuff ! Twice a week? That's it? I think you like Eggo waffles because they rhyme with Lego waffles. They're not ACTUALLY made with Legos, you know. My toaster is an oven. I have to open a door and stick the thing I want to toast into it. There's no button to push down. Maybe someday you could do a modified recipe for people whose toasters have no button to push. I do have a twisty thing but it just has numbers on it. I think the numbers stand for how many things you're putting in it to toast. Like, if you have 150 things to toast you turn it to 150; if you have 250 things, you turn in to that. I always only have 1 or 2 things to toast. I think my toaster is like a professional model or something for people who toast a lot of things because the dial starts at 150. Anyway, I'm sure that for people who have the type of toaster you have, this recipe would be really useful. Why on earth would your wife put frozen waffles in the microwave?? They come out all soggy and floppy! I make this for breakfast at least twice a week, often more. Right now we are out of frozen waffles because I ate most of them myself. Ha, kids, have fun with your raisin bran tomorrow.